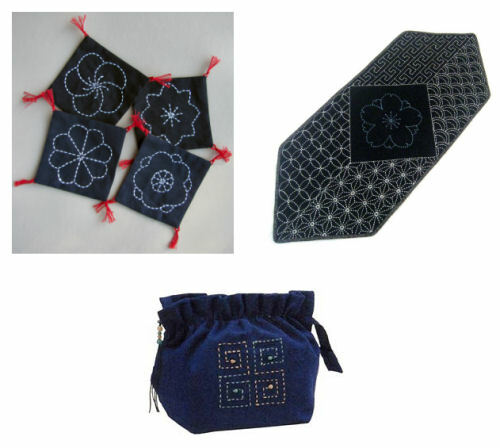 My rowdy ruffians have really taken to sashiko stitching. They’ve always been interested in needlework, but they have never been as diligent they have been the past few days ma shaa Allah. Perhaps it is because sashiko is, as Charlotte Mason said about how children’s work should be kept, “well within their compass”. They love the designs that are simple yet pretty and are looking forward to tackling the more detailed ones. This craft is both decorative and functional – it can be used as a decorative surface for things like mats, bags, sheets and table runners and as a quilting technique to bind layered fabrics like blankets, coasters, placemats and pot holders. It is especially useful in strengthening household items that go through a lot of wear and tear. We intend to use our kids’ sashikos to decorate our walls in shaa Allah – our place could do with some prettifying! Maybe we can move on to making some dastarkhwans for our meals! You can see more pretty stuff here. I don’t have all the necessary materials so I contemplated purchasing some kits, but they are a little pricey. (Also, not all the patterns come with dashed lines – i.e., you’d have to figure out the length of dashed stitches yourself and I didn’t feel comfy with this.) Since I do have a stash of embroidery flosses and calico, I felt it would be enough for us to just do an adaptation of sashiko and to focus on just the technique :) I used this tutorial and this one to get us started. Here are some of the designs we have saved. You can download them and transfer them onto your fabrics for stitching. Not all are very clear so you’d have to tidy up the dashes when you transfer the patterns. (The stitches should be as even as possible.) I hope you enjoy them and let me know what you’ve come up with! Now I do not know what this transfer sheet is all about also I am thinking there is Japanese Store here with plenty fo Japanese stuff for reasonable amount. Insha Allaah after we get a way of going there I will ask them and check this out. I hope they have a simple cheap kit to get start something. Thanks for all the links, will go through and see how well I can come up with something. I need some stuff to purchase Insha Allaah hope and pray I get to do my long pending shopping soon. Transfer sheet is just a type of carbon paper – only it is not as dark and probably washes out more adequately. I can’t wait to see what you guys come up with! Can you try ready-made stamped embroidery designs? The kind you can select and get stamped on your fabric. These are available at shops which do machine-embroidery. They use some white ink to stamp them onto dark fabrics. Oh I should try that, shouldn’t I? My mum-in-law’s helper who is an amazing stitcher embroidered a HUGE bedspread that she got stamped from a store. It was a white sheet and the stamp was a grey colour. I had NO IDEA that they also stamped on dark fabrics! In shaa Allah I will try those :) Jazakillah khayran for the tip! Wa iyyaki! Can’t wait to see your crafty goodness! I keep trying to leave comments and they keep getting eaten up or something! Let’s try one more time. I love this stuff and I think my girls will too in sha Allah. So sorrry if my site is acting up … I know my WP needs upgrading and what not! I’d love to see your girls’ work :) I’ll bet they have your crafty genes!